In the happy world of Pinterest I have seen many ideas for ‘alternative advent calendars’; countdowns to Christmas that you can either buy or make that go beyond the standard chocolate affairs. One idea I really liked was of sharing a different book on each day of advent. Combining this with my slight fear of the Elf on a Shelf phenomenon (it can’t just me that finds that elf creepy looking?! 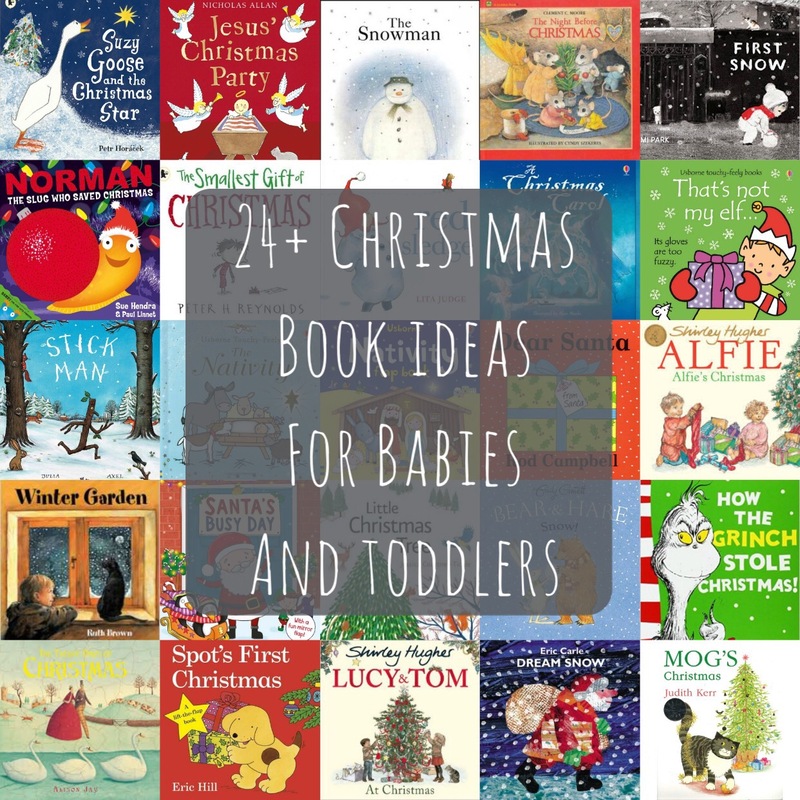 ), I was inspired to think of 24 books I’d share with Felicity that would appeal to babies and toddlers. Lots are about Christmas, but some are just about snow and winter more widely too. There’s one for every day in the countdown to Christmas from the first of December, but I think this year we may use the list more as a starting point to get some good idea for Christmas and wintry themed reads. I’ll definitely not be organised enough to wrap them up and display them in a suitably Pinterest friendly way, but I have enjoyed getting into the Christmas spirit by discovering some new classics. There are a few of the obvious big Christmas hitters on the list (like The Grinch and The Night Before Christmas), but I have saved some suitable for older children to look at in later years as well. Also, it would be mega expensive if you were to buy all these new – there’s no reason you can’t get them from the Library to enjoy during Advent. Our local libraries have already got a special section in devoted to Christmas books out and ready to go. Happy Christmassy reading! Stick Man by Julia Donaldson, illustrated by Axel Scheffler. Any list of children’s books has to include a Julia Donaldson in my opinion. Stick Man is our favourite Christmas related one (Santa makes an appearance). The rhyming words are Julia Donaldson’s with Axel Scheffler’s illustrations – the same team behind The Gruffalo. I got a little bit too invested in poor Stick Man’s quest to return to his family, it seems very emotional for a children’s book! The Night Before Christmas by Clement Clarke Moore. ‘All through the house not a creature was stirring, not even a mouse’. No Christmas book list is complete without this classic rhyming book. I can still remember the illustrations in my childhood copy so clearly, and there are dozens of different picture book editions to choose from. If doing the advent calendar – surely this is the only choice for the Christmas Eve book? Lucy and Tom at Christmas by Shirley Hughes. This is another from my childhood – Shirley Hughes is the only person honoured enough to be on this list twice. Possibly a little bit grown up for younger toddlers, but Hughes classic illustrations are beautiful and capture the gentle magic of a home based Christmas for young children. One to treasure for years and years. That’s Not My Elf by Fiona Watt, illustrated by Rachel Wells. There are many Christmassy/winter options to choose from in this ubiquitous Usborne touchy-feely series. Including Not My Reindeer, Santa, Polar Bear and Penguin. Felicity is still a big fan of these as they are very easy for little hands to turn pages as well as feeling the different textures on each page. A Christmas Carol, illustrated by Alan Marks, with sounds. Felicity has always been a fan of a noisy book, and this combines a reselling of the classic Dickens tale,with sound effects. I really want to have a tradition of a reading the original aloud when she’s a bit older (we’ll see how that goes) this is a good starting point. The Snowman by Raymond Briggs. This is possibly a little old for most toddlers, but a great book to save for years to come. Especially when combined with the TV ‘Walking in the Air’ version, which I’m very much hoping will include the David Bowie introduction I remember from when I was little after his sad death earlier in the year. For those not familiar with this 80s childhood classic, it’s all about a snowman coming to life one magical night. Suzy Goose and the Christmas Star by Petr Horacek. Horacek was a new to me author until recently, but I’m such a big fan now (as is Felicity). Something about his illustrations seems to capture her imagination and I love his slightly quirky stories too. Silly Suzy Goose is one of our favourites, so I’m looking forward to this Christmas story featuring Suzy. Mog’s Christmas or Mog’s Christmas Calamity by Judith Kerr. Although not usually tolerant of books for slightly older children (the books are quite long), Mog is magic and keeps Felicity absorbed, even reading all the words. So I had to include the Christmas adventures of the Thomas family and their ‘nice but not very clever’ cat Mog. Winter Garden by Ruth Brown. I’ve mentioned before about our love for Brown’s A Dark Dark Tale. This book is more specifically designed for toddlers but contains the same quality of gorgeous illustrations. It looks at all the creatures and wildlife that visit a garden in winter, perfect for cozying up with indoors whilst looking out at a wintery garden. Norman: The Slug Who Saved Christmas by Sue Hendra & Paul Linnet. Possibly a bit long for very little ones, but the bright illustrations (and glitter) more than make up for this in Felicity’s eyes. Also a book where the slug is the hero, and snails are used as replacement reindeer, is definitely a nice change of pace for a Christmas story. The Smallest Gift of Christmas by Peter H. Reynolds. This is a great bit of respite from what can feel like the tide of plastic uber-consumerist Christmas. Disappointed with his one small present on Christmas morning, Roland wants something bigger. This is obviously not the point of Christmas, as is then demonstrated in a modern gentle morality tale. Spot’s First Christmas by Eric Hill. For ages she wasn’t bothered, then almost overnight Felicity was won over by the institution that is Spot the Dog. Much like Mog, there is some sort of magic dust on Spot which make him and his groundbreaking lift-the-flap format irresistible to little ones. Dear Santa by Rod Campbell. This is a Christmas version of the bestselling Dear Zoo, with the zoo animals being replaced with presents from Santa. We’re already getting a lot of finger points to read this again and again here, even if it is still November! How the Grinch Stole Christmas! by Dr Seuss. I’m simply not worthy of providing an introduction to this classic. Like a lot of Seuss it may be a bit long for younger toddlers – though Dr Seuss’ rhymes are great for non-moving little babies – but is such a classic it was one I felt should be on our bookcase. Dream Snow by Eric Carle. My Hungry Caterpillar needs no introduction. There is just something about Carle’s illustrations that both please parents, and delight and captivate children. So I just had to include this, his Christmas offering, on this list. Jesus’ Christmas Party by Nicholas Allan. This is a take on the nativity story, from the perspective of the Inn Keeper, who just wants to get to sleep but keeps being woken up by Mary and Joseph, some Shepherds and a very bright star. This is a clever book that retells a the story in such a way that it would work for Christians, but also as a good introduction to the Christmas story for everyone, without overtly concentrating on the religious aspects. Alfie’s Christmas by Shirley Hughes. Another from Hughes, there’s something about her illustrations that capture the liveliness of children so well. I also particularly like them because they feel like real families rather than stereotypes. Lucy and Tom I remember from my own childhood but I never discovered the Alfie books – so I’m looking forward to looking at the illustrations in this book with Felicity. First Snow by Bomi Park. This is from a Korean illustrator and I really like it as a change from looking at snow from a very rural perspective – this has scenes set in an obviously urban environment. The illustrations are unusual and stunning and immediately caught my eye as something very different from many children’s books. Little Christmas Tree by Jessica Courtney-Tickle. If you want a more sophisticated lift-the-flap book then this is an excellent choice. It also emphasises the natural world in its depiction of wildlife gradually decorating the little Christmas tree. A book that is likely to be picked up for longer than other more primary-colour based lift-the-flap offerings. The Red Sledge by Lita Judge. This is a lovely looking book. I want to get Felicity a little red pixie hood because of it. This book has no words aside from onomatopoeic sounds that help tell the story, so it’s a good book to have lots of fun reading by putting a lot of effort into the telling. There are some wonderfully expressive noises to represent the animals getting up to high jinks on the borrowed sledge. Santa’s Busy Day (Bloomsbury Publishing). Mirrors are always a big success with Felicity, she’s a big fan of her own reflection! This book has a mirror at the end as we see Santa’s lead up to Christmas. Bloomsbury’s children’s books have really impressed me since having Felicity, so I’m hoping this goes down as well as some of their other board books we’ve tried! Usborne Touchy-Feely: The Nativity or Nativity Flap Book (also Usborne). I think one traditional retelling of the nativity is a must for every Christmas book list, even if not for religious reasons, it provides a background to the traditions of Christmas. There are literally hundreds of different versions. I’m still looking for one that I really like in the more traditional picture book format – my ideal one would include non Westernised/caucasian depictions of the family – but these two are very good for this age group (even if Mary is blonde in one – grrr). Bear & Hare: Snow! by Emily Gravett. I have a big soft spot for the work of Emily Gravett, and this is a lovely feeling (as well as looking) book. In the hardback edition at the least the pages are thick and really show off the lovely almost watercolour illustrations very well. The plot is all about how Hare really likes snow, but Bear isn’t quite sure to begin with. Twelve Days of Christmas by Alison Jay. I’ve been surprised by how much Felicity loves books that you can sing to her, so I think she’d love us singing the Twelve Days of Christmas accompanied by the gorgeous illustrations. There are lots of other options as well including noisy Christmas song books that when you press the button play the tune, or Usborne do a collection of some of the most well known carols. As with the nativity books, there is something in this genre to suit every taste. And that’s the end of the list – I’d love to know if you feel I’ve missed off any absolute Christmas must haves for very little children! This entry was posted in Reading with Felicity and tagged Books, Children's books, Christmas, December, Reading with Felicity, Winter. Bookmark the permalink. Lovely list – I’ve added a few of these to my Matilda wishlist so fingers crossed the grandparents notice! I got M “Santa’s Beard” last year which she loved – I don’t think we’ve gone a week without reading it; she also liked “That’s Not My Reindeer” although is a lot less interested in the “That’s Not My…” books now; and I bought an illustrated version of “Snow” by Walter de la Mare which she wasn’t ready for but which is beautiful. This year, I’ve bought “Little Santa” which is for slightly older kids (and adults) but was too funny to resist. Richard grew up reading A Child’s Christmas in Wales every year, though I suppose that is for slightly older kids. I never had any particular Christmas books as a child, though; it was mostly singing that was a Christmas tradition for us. Just like that, we were in Brussels and then home! As we travelled to Amsterdam by train we took the opportunity to stop in Brussels and catch up with friends for lunch (and baby cuddles!) yesterday. I think Chick feels that Belgium is a wonderful and magical land as she was given a chocolate in the train buffet, a chocolate biscuit as we were leaving the restaurant and our lovely friends had bought us chocolates too. Chocolate did help get us through what turned out to be a pretty epic travel day though. We had to leave Amsterdam earlier than planned as engineering works meant we had to change trains in Rotterdam. We then had a very delayed Eurostar at the end of the day (although they have been so efficient at contacting us about a partial refund), which meant we were late home by toddler standards. Chick coped amazingly though and was most excited about being allowed cereal for dinner! I’m glad we planned to have today to regroup, we went out for a coffee, cooked a roast and generally prepared for the week ahead. It hasn’t put me off travelling by train to Europe one bit though. It is so much more pleasant than flying, the seats are comfy, you see something of the countryside and can get up and wander about whenever you want. It’s also the best way to travel in terms of environmental impact. Plus we only paid £35 for our ticket from London to Amsterdam! This was Chick’s absolutely favourite thing in Amsterdam - a cat rescue centre on a boat! I was beginning to think it was a terrible idea as we queued in the rain - but her squeals when we got onboard and she kept seeing more cats in every available nook made it all worth it.